Wondershare LiveBoot 2012 is a great and must have software. 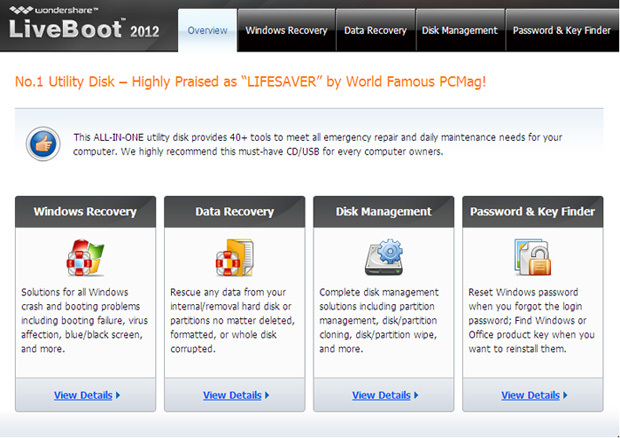 It is one solution for Windows Recovery, Data Recovery, Disk Management and windows password recovery. Using Wondershare LiveBoot you can create bootable CD or USB drive. You can use this bootable CD / USB to boot up any computer, as well as fix computer bootup problem, rescue data, backup and restore file or system, clone and deep wipe disk, manage disk, etc., over 40+ utility functions in total. Normal price of software is 59.95$ But you can get the software absolutely FREE!! For limited time the company is running giveaway of the software. Just visit the giveaway link, fill the form and you will receive your license key instantly via mail. The giveaway ends on August 12, 2011 So, get your license key before it ends.